There is no shortage of amazing things to see in Florence—from the famous Duomo to the Uffizi Gallery—and adding Pisa to the mix you're sure to have a packed day. 4 people in comfortable Mercedes van. 4 people in comfortable Mercedes van. Driver knowledgeable in history & culture of region. 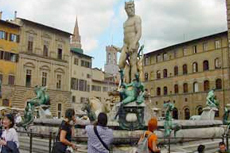 Gave us ground orientation & maps highlighted with places to visit in Florence & Pisa. It was a day long trip about 8 1/2 hours total. The Florence tour was OK it seemed like they took you to places to spend money so they could get a Kickback. The Pisa tour was lacking any tour guiding you could have gone on your own I should have. What a beautiful city and our tour guide bought it to life. Hard to communicate with booking agency, but Luigi, our driver, worked hard to get us where we wanted to go. We didnt think we wanted to go the leaning tower of Pisa, but he talked us into it - glad he did! It was amazing! Nice time at Pisa, lovely day in Florence sightseeing eating drinking shopping. We wanted to try a private excursion for comparison purposes. Nice bus, great guide (Daniella), and enough time at both locations. Long walk from/to bus in Pisa - fast pace. Great trip, lots of walking, but an amazing experience enjoying the sites. We booked Florence and Pisa on our own; having the bus rides to/from each place was great, and we really liked having time to explore on our own. Both days in Florence were great - tour of Pisa was wonderful and the walking tour the next day was great - our guide gave us lots of information and we were on our own but well prepared because of her and had a fabulous day! We did Florence on our own and Pisa. The tour was very good, but you wonder why so much hype for this leaning tower. The tour was very good, but you wonder why so much hype for this leaning tower. The excursion was very good despite that. It was nice to see the Leaning Tower of Pisa. It was nice to see the Leaning Tower of Pisa. This was the most crowded of all excursions, but still nice. Weather was miserable but guide got us to Pisa early enough to avoid storm and to Florence for entrance into see statue of David. Only a 25 min wait. We lucked out. Beautiful city. We walked out from the ship into the port building at 10am after breakfast. Bus journey only 3 hours Florence 1 hour Pisa. Bus journey only 3 hours Florence 1 hour Pisa. Bus was late waiting for people at Pisa and missed last shuttle bus but the Tour company got permission to deliver us straight to the port on time.